Where will we make things in the future and how will the concept of a factory evolve? How we answer these questions is changing, says Professor Duncan McFarlane, Head of the IfM’s Distributed Information and Automation Laboratory (DIAL) and that is affecting our priorities for automation. When we think of a factory we still tend to default to an image of a large building in which raw materials are transformed through a series of processes into finished products. That idea of a factory has not changed much since the first industrial revolution, even though our supply chains have become long and complex and production operations are spread over multiple sites. These days data is as much the lifeblood of factory operations as are the raw materials and manufacturers increasingly offer services as well as products. And, as we become ever more conscious of the impact manufacturing has on the environment and our natural resources, how we handle waste and re- use materials is a major preoccupation. Our notion of the factory is, therefore, beginning to undergo a radical reconceptualisation. 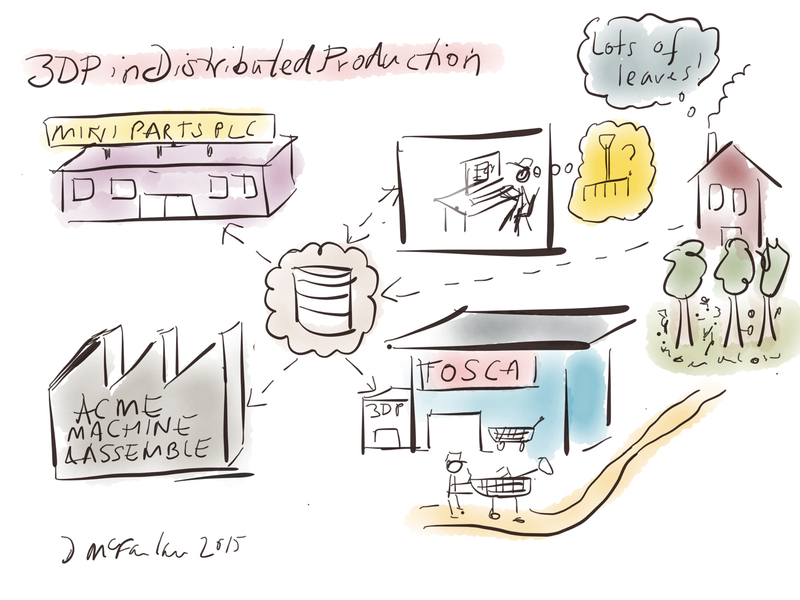 We see factories that no longer operate in isolation but are instead part of a complex production network in which different steps in the process take place in different locations. We have seen a growing trend towards ‘late customisation’, the manufacture of a core product which is then customised in a multitude of different ways. A good example of late customisation is the mobile phone, with one firm making the base processor and screens then sending them on to other factories where they are cased and packaged in a plethora of different ways. Question: When is a factory not a factory? Answer: When it’s a shop, or a farm or a building site. In other words, we are also seeing what could be described as conventional manufacturing activities taking place in non-factory settings. This could be anything from the machine in a DIY store that mixes and produces your paint while you wait to the harvesting and processing of lettuces destined for the supermarket shelves. Equally, the big construction companies are becoming much more factory-like both on site and in making modular components offsite. So we increasingly have mobile, smallscale, one-off production that does not necessarily take place in a factory. At the same time, we see the concept of a factory encroaching into ‘non-making’ environments such as airports, logistics, hospitals and repair stations. These types of organisations are increasingly adopting factory-like approaches and processes and share many of the operational challenges faced by factories, such as resource constraints, cost thresholds, quality targets and customer service levels. Question: What does this mean for automation? Answer: As the boundaries of manufacturing expand, we encounter a whole new set of challenges for automation. In this context, it is important to define our terms by making a distinction between automation and computerisation (or digitalisation). The two things are not synonymous. Early instances of automation involved almost no computerisation – the automation of transportation with railways, for example, or agriculture with tractors. Equally, there are plenty of activities in which computerisation supports manual operations and has nothing to do with automation. But the key space - and the one we are interested in - is computer-based automated operations. In our conventional manufacturing model, firms have tended to focus on three core imperatives: productivity, sustainability and resilience. From an automation perspective that has resulted in a number of outcomes such as automating asset maintenance to increasing productivity or integrating energy and emissions control with production operations to improve sustainability. Firms wanting to become more resilient seek fast detection of disruption and dynamic ways of managing their processes. But how can automation continue to improve productivity, sustainability and resilience in these new manufacturing paradigms? The trend towards specialisation, customisation, distribution and servitization demands a whole new set of requirements. Specialisation means firms need to be good at automating not just how they make things but how they set up the equipment to make things. To customise, firms need to excel at tracking products through the supply chain. For distributed manufacturing, firms need to develop efficient production management strategies, perhaps using the cloud to enable the coordination of multiple sites with one system. For firms looking to develop services, one of the key challenges is how can they couple information with physical products and systems in order to deliver not just a product, but a service associated with that product. Clearly, many of these automation strategies fall within the scope of initiatives that are loosely characterised by the term ‘the Fourth Industrial Revolution’ (IR4). Industry 4.0, with its focus on the computerisation of manufacturing, and the development of the Industrial Internet of Things (recent IIoT report by Professor Duncan McFarlane) certainly encompasses some of these automation agendas. But while IR4 – and its associated terminology – can be helpful in supporting the drive to digital we have to guard against seeing it as an end in itself. Firms need to understand the drivers of innovation as well as their own strategic objectives and develop clear-minded automation strategies to support them. One of the new production models is likely to be distributed manufacturing. This poses a number of challenges, not least the co-ordination of production with logistics. In a recent project, the DIAL team looked at ways in which cloud computing can be used to distribute and manage the operations of production sites from a single control system. In particular, it focused on 3D printing and how to integrate it with conventional manufacturing across multiple sites. Boeing’s Interiors Responsibility Center (IRC) has to manage high levels of customisation. Each of Boeing’s airline customers has its own branding and often uses different branding for different routes. At the same time, the specification of aircraft interiors is becoming more and more sophisticated as new technologies emerge and airlines become more attuned to the psychological and physiological effects of flying on their passengers. The IRC runs on ‘lean’ manufacturing principles but finds that variability in the composite components can cause disruption to the production line. improving track and trace concepts that can be adopted within production control systems. The DIAL team specified more intelligent production control systems and tighter raw materials and part tracking that will tolerate higher levels of product variability and which can also dynamically alter the balance between lean and resilient operations to cope with disruptions. How and when to automate my own operations? DIAL have created a structured assessment tool for identifying where your organisation will see most benefit from automation. Industrial Internet of Things Report by Professor Duncan McFarlane, Head, DIAL. Further reading from DIAL in the areas of automation, strategic asset management, and digital manufacturing.